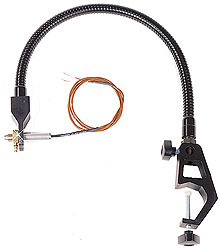 For fast and convenient mounting of OS36 Series infrared thermocouples (especially for testing), the gooseneck mounting kit provides an inexpensive method to quickly install an infrared thermocouple directly on the production line. Heavy duty design provides excellent stiffness for reliable positioning. Clamps are fabricated of aluminum for durable performance.